As 2018 quietly bids us farewell, many of us find ourselves reflecting upon this past year. Where we were when 2017 slipped away and 2018 began, how did we spent our spring and summer, where did autumn find us…and now, where are we now? Did you keep the resolutions you made last year? Did you complete the items that were on your ‘to do’ list? Reflection at the end of a year is common. What if we decided to reflect periodically throughout the year? Say monthly, weekly, even daily? Reflection is a good way to keep ourselves accountable. 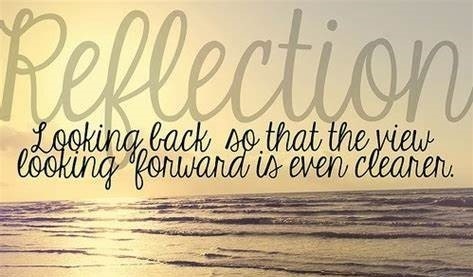 If we were to choose to reflect often, we would be able to ‘course correct’ if we got off track, instead of, at the end of year, realizing that some things didn’t get accomplished…and have regrets. Reflection is all about creating self-awareness…it is a process of going within. When we set time aside to reflect, when we quiet our minds, we allow new ideas, new ways to doing things, new perspectives to emerge. 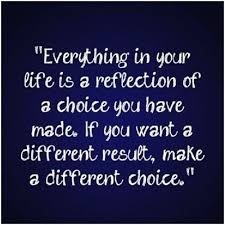 Reflection helps us gain a better understanding of what drives us, our strengths, our weaknesses. Daily I have tried to (and for the most part I’ve succeeded) remain in a state of gratitude. I have made a point of not participating in gossip (waste of time). I have tried to remain ‘in the moment’ and have experienced life as it comes – without ‘getting ahead of myself’ – just trying to find enjoyment in the here and now. For accomplishing these things, I am thankful…it wasn’t always easy, but, being in the moment has allowed me to stop, think, and proceed from a place of love. In my articles that I’ve shared with you since June, I have often referred to my faith in God. As I reflect upon this year, I am pleased to say that my faith has continued to evolve and grow - and as it has - the people, as well as the situations, that have come into my life have echoed my spiritual growth. Without a doubt I can state that what you put out there in the universe, through your words and actions, does indeed come back to you. As I entered 2018, I made a vow to myself, to set time aside daily, to reflect. It is through reflection that I was able to ‘course correct’ when I strayed from my path. Daily reflection led me to accountability and being accountable led me to offering gratitude to God for my achievements and my failings led me to pray to God for guidance. As the saying goes… “All roads lead to Rome.” My God (Creator/Universal Spirit) is at the center of each of my days. Reflection has allowed me a self-awareness which has shown me that I am not capable of living my best life without my faith in God. 2018 will soon become a memory. Looking forward to 2019 allow yourself the indulgence of time for reflection and prayer. You deserve to live your best life… go on and live it with guidance and support from your Creator.